This is what properly-cooked quinoa should look like. When quinoa goes on sale, it’s time to stock up. 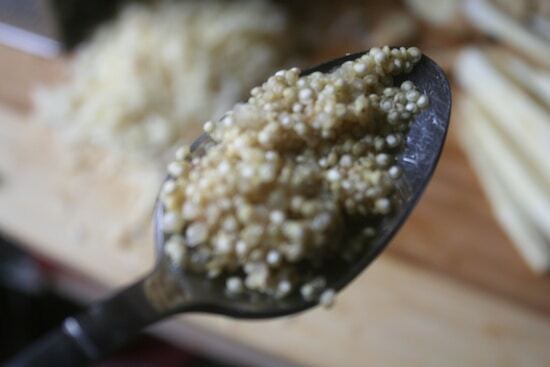 A cup of quinoa – roughly a tenth of a pound – yields three cups of quinoa cooked. That’s an amazing opportunity to save money. But why, on Earth, would you stock up if you have no idea how to cook it? What is quinoa, and how does it taste? It comes in a ton of varieties – red and purple, to be specific – and tastes more like chewy little balls of goodness. If anything, they taste the way you’d expect a seed to taste. It’s more like a faint cross between a peanut and a sunflower seed, though it is unrelated to both. How do I store quinoa after buying it? Keep your quinoa in a sealed container. You don’t want any little critters to find your good stuff. It doesn’t require refrigeration, and can be stored in the dark. It can keep for up to 6 months without cause for concern. What goes well with quinoa? Anything that you’d do with rice, you could do with quinoa. Though they don’t cook the same, they still serve the same purpose – a grain that can fill you up at a cost cheaper than strictly a heaping helping of veggies, especially considering the amount of protein that quinoa has. How do I prepare quinoa? 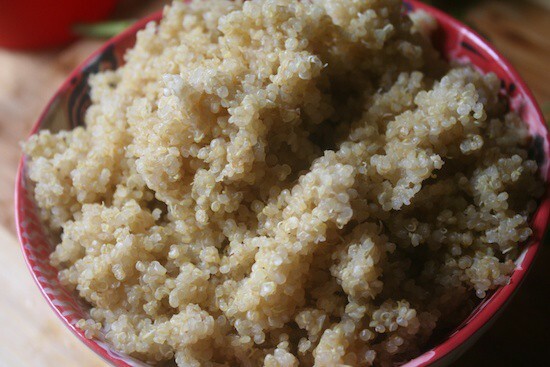 Cover your quinoa with water in a deep container, and store them in the fridge overnight. This will cause them to soften – not unravel, though – and can be tossed with herbs to be included in your salads as toppings. Quinoa is extremely fibrous in this state, however, and should be used sparingly… unless you’re at home and not going anywhere for a while. Just.. don’t say I didn’t warn you. You can, prior to boiling your quinoa, toast your seeds in a skillet without butter or oil; you just want to heat them up a bit before boiling, which brings out a bit more of a nuttier flavor in them. 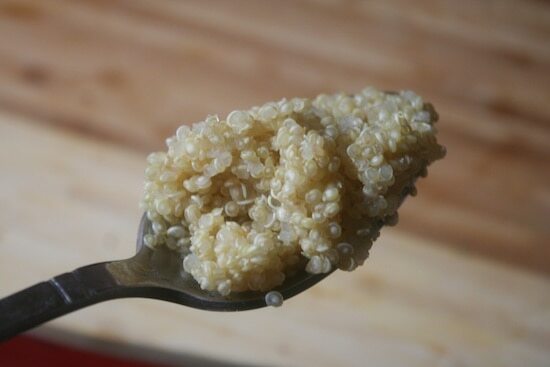 If you use a fat to toast, your quinoa will come out a bit bitter. You should, however, run a little oil around the inside of your pot where your quinoa will be cooking. This helps prevent it from sticking to your pot after its finished. Always pre-rinse your quinoa. Always. Even if it says it’s “pre-washed,” never give it a second thought. Wash it anyway. 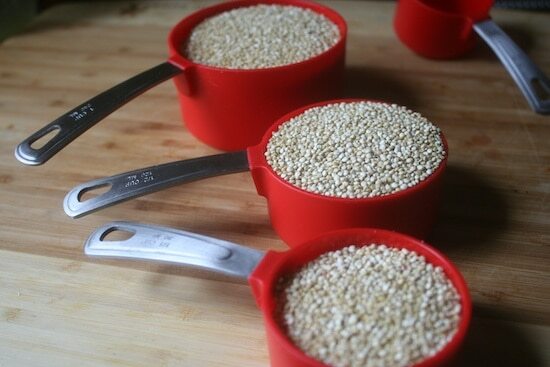 Pour your quinoa into a colander or sieve, and run water over it until the water looks clear. Quinoa is best cooked in a “set it and forget” kind of style in my house. Equal parts of quinoa and water go in a low-heated pot, with a pinch of salt for every cup of quinoa included. (Basically, if you add 1 cup of quinoa, add 1 cup of water.) Bring quinoa to a low boil, and cover your pot. After 8 minutes check to see if all the water has been absorbed. If not, give it a couple more minutes. and it should be chewy, with a little bounce to it. 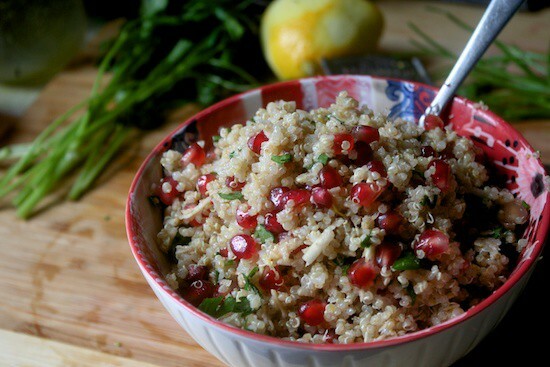 Take your three cups of cooked quinoa, throw in a cup of pomegranate seeds (dried cranberries would work in its place, too), a cup of shredded parsnips (yes, shredded using a cheese grater), a handful of fresh chopped parsley, a squeezed lemon (the zest of it would also help), a teaspoon of coriander and a pinch of salt…. How do you like your quinoa? Thanks for this how to. I am not the best at cooking grains. Brown Rice is hit or miss with me. I usually do a lot of different squash’s with salad and greens. I will try it this weekend. Do you have a tutorial to make polenta or use corn meal? I wonder how you feel about blackpeoplemeet, BET. There are other sites, magazines geared toward men non-blacks, have you contacted them ALL to state how offended you are? Oh, I’m sure she feels some kind of way about those, too. Your tactful manner of dealing with such unpleasantness is amazing. Other blogs might have just deleted the comment completely, where you try to share where you’re coming from (whether or not the person wants to learn…. eehhh, that’s probably a different story). …apparently I was wrong & it does need to be said. Either way: your patience is commendable. I have heard much about quinoa, but never how to cook it properly. 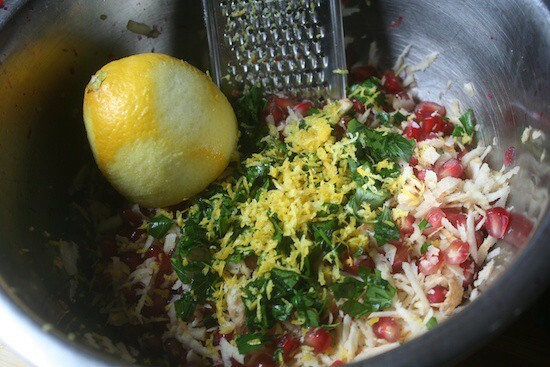 Plus, the recipe sounds delish (I <3 pomegranate). Gotta try this out! I am about the whitest white that ever whited and I just want to say I love and appreciate your blog. I just started clean eating and articles like this are really helpful for me. Thank you so much! Maybe one day you even get a hug from a black person lol..btw quinoa is excellent food and it does the body good.:). I love my quinoa in a black bean salad – green onions, tomatoes, black beans, roasted corn, and some seasoning. Hey Tiffany, I am totally “seasoning” uneducated. Growing up it was salt, pepper, garlic salt and onion salt. The ingredients in your quinoa salad sound awesome, will you elaborate on what type of seasoning you use? So before I saw this post I found a recipe for quinoa. It came out great flavor wise husband liked it BUT I could not eat more than a few bites because of how it looked. The unraveling of the grain was a bit too much for me. Lol! So now I am thinking coucous. Is that a good sub or should I just do brown rice? Unraveling black eyed peas is gross too, but their delicious! Yep. Good stuff. Thanks, Erika! Thanks so much for the easy to follow steps for cooking Quinoa. The pictures are unbelievably helpful to me. Many websites don’t include tips and the “basics” for people who have no clue how to cook this, I’m glad you did! The first time I cooked it I did the water, no salt way and it was good. So, the second time I cooked it, I did the low sodium chicken broth with a little bit of roasted onions – da bomb diggety. Right after cooking a pot-full, and almost running over, I found a recipe for quinoa with greek yogurt and berries for breakfast. Talk about lip-smackin! But what I had in my fridge was the savory sort and could not be used in that format. From now on, whatever I plan to cook, I will divide it and make half bland and half savory.